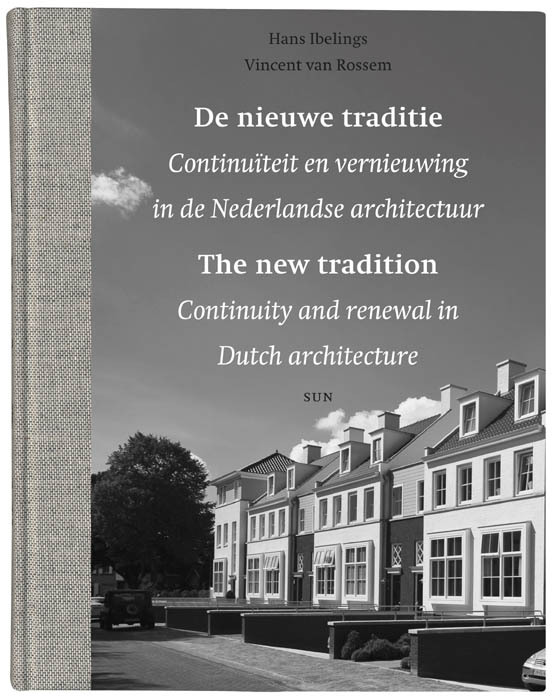 If the subtitle of this book is true, we have here the definitive book of books, the mother of all architecture dissertations: Continuity and renewal in Dutch architecture. I expect a series in 12 volumes, starting with medieval turf huts and ending with the burnt-down CCTV building. But titles can deceive. The new tradition is an overview of what professionals and the public alike term ‘traditionalism’; a century of traditionalist architecture and urban design, with an emphasis on the last fifteen years. The common definition of traditionalism  the conscious reversion to traditions in building as regards form, structure and function  offers a succinct description of what this book is about. I cant summarise its subject any better than with this definition. But the word traditionalism is noticeable by its absence. The avoidance of the T-word gives the impression that the book deals with a taboo. Circumventing the notion of traditionalism is not only a linguistic issue. It is a missed opportunity to define traditionalism precisely and to point out the difference with regionalism and critical regionalism. A comparison could have been made with classicism and with new urbanism. A fundamental (theoretical) framework is sorely needed to support, deepen and develop traditionalism. That is, of course, the motive for this book, but avoiding the right title make you think that traditionalism as such is somehow tainted, that nobody wants to be associated with it. That, to me, is incorrect. It is high time to name traditionalism in plain language and embrace it if desired. After all, the past teaches us that reappropriating a name (faggots, rednecks, punks) is a good strategy for emancipation. And traditionalism itself teaches us not to reinvent the wheel all the time but, instead, to benefit from the lessons of history. That is to say that the new tradition is positively ambitious in theoretical terms. The text on the back flap reads: ‘If one puts bourgeois housing at the centre of architectural history, it becomes clear that the radical experiment of modernism was no more than an incident’. Right on target! The change of perspective in this book transforms the dominant line of thought into a footnote. But because the T-word isnt used explicitly, this argument isnt convincingly substantiated. The 270-page coffee table book (somewhat oversized and certainly not portable) is written by Hans Ibelings and Vincent van Rossem. 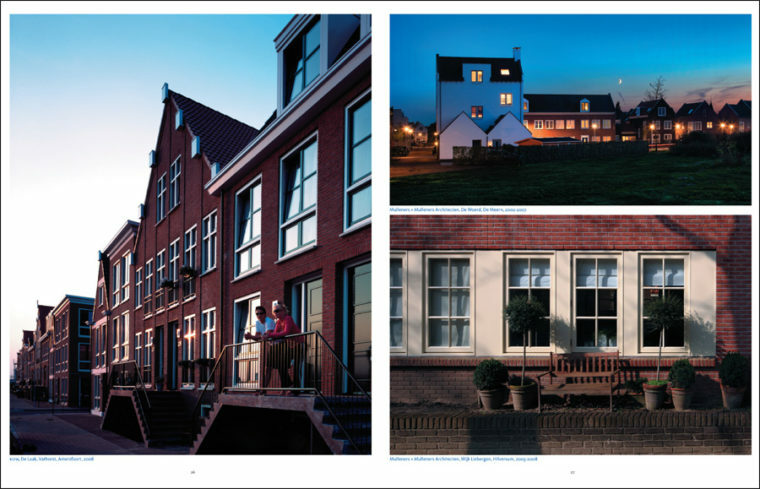 The book includes photographs of completed projects and drawings of neighbourhoods and villages, most of them designed by Mulleners + Mulleners, Scala, Molenaar & Van Winden, KOW, Soeters van Eldonk, Krier Kohl, Six Architects and LSW Architecten. Facade drawings, floor plans and sections are omitted entirely. The book seems aimed at a wide audience and not solely for professionals. And that aim has been achieved, because the book is accessible. Ibelings in particular clearly describes what this architecture is about. The new tradition is expressly a compilation of work by two authors, with an abrupt change from one to the other on page 185. In part one Ibelings describes contemporary architecture practice as he zooms further and further out from the daily housing conditions. That results in a clear division into chapters: home, neighbourhood, village, city, landscape. It is, in effect, a substantial yet sympathetic essay (c. 6000 words and lavishly illustrated) in which Ibelings argues for a greater understanding of history in the development of new projects. The political and social tension surrounding the subject becomes clearer when he hints at the books aim. On page 89, for example, he writes: ‘Architects […] usually show more interest in the city than in the village. They are more fascinated by the feverish dynamics of a steadily growing metropolis than by the peaceful continuity of rural settlements.’ And on page 39 we read: ‘In the Netherlands the trend is only to often to reinvent the wheel […] and above all not to draw any lessons from the past’. The charge gradually becomes explicit: because of modernism, architects have developed an over-fixation on innovation and renewal in the area of typologies and materials. Traditionalists oppose this, advocate a view of profession based more on craft, and search for continuity in architecture (hence the books title). Occasionally it becomes obvious what the book is really trying to do, namely to offer a counterweight to the prevailing view of architecture. Oops, is there a customary view of architecture? Most architects dont think so, but traditionalists think there is. They are of the opinion that modernism is too dominant in both architectural education and practice. They think there is scant regard for the discipline as a professional craft and skill. They think the architectural discourse is too hermetic and too inaccessible, and is based on too many assumptions. Now and then  not in this book  a comparison is made with politics before Pim Fortuyn. The New Urbanists add that people and human behaviour are not taken as the measure of things in urban design as often as they should be. This group is stronger abroad than in the Netherlands and has viewed sustainability as of paramount importance for a long time. Giving people many choices for living an urban lifestyle in sustainable, convenient and enjoyable places, while providing the solutions to peak oil, global warming, and climate change. But although there is enough ammunition, the author decides not to go on the offensive in this book. After page 185 Vincent van Rossem takes over with an exhaustive historical essay (‘Timeless‘) that spans 25 pages. Van Rossem has an unmistakably academic style of writing and needs no fewer than 49 footnotes, whereas Ibelings needs none. While even non-professionals will understand part one of The new tradition, part two makes for heavy reading, even for insiders. The large discrepancy in approach between the two authors does not benefit the book. They work alongside each other but not together. A discussion on this theme has not, it would seem, been conducted between the authors. The result is therefore neither a comprehensive argument, nor account, nor study of historical facts, nor picture book. In that sense the publication is tentative, encompassing as it does a little bit of all of those character traits. True to its title, The new tradition deals exclusively with projects in the Netherlands. The historiography, however, introduces an international perspective. A correct decision, I think. No matter how nice it is to see foreign examples, this book is about the Dutch situation. The book describes how that development, past and present, is inextricably linked to developments elsewhere. Van Rossem in particular refers frequently to the English and German history of houses and residential districts. Another interesting thing is that the book doesnt confine itself to buildings. A substantial part concerns traditionalist urbanism  which is generally more appreciated than the architecture. 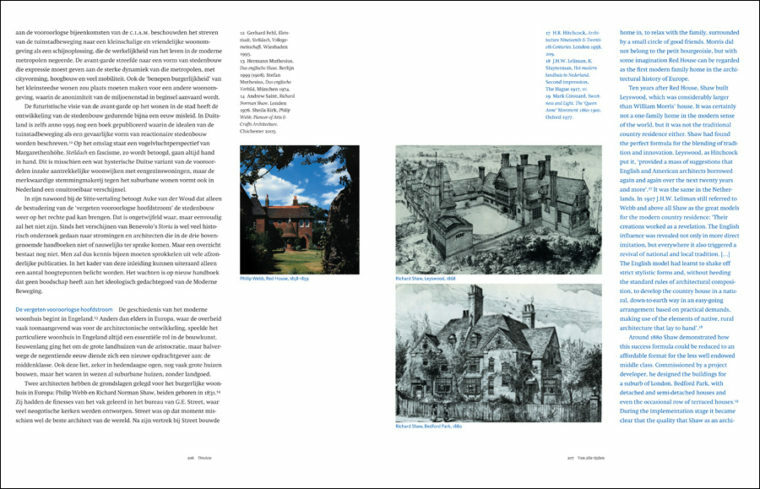 Ibelingss chapters on Neighbourhood, Village, City and Landscape go beyond the individual building and Van Rossem, too, writes extensively about the Garden City, Plan Zuid and the historical city. Moreover, a lot of attention is devoted to landscape and public space. This is useful because intelligent and careful solutions are often devised at the level of exterior space. Traditionalism means no Vinex front gardens but doors that open directly onto the street, no cars parked lengthways along the street but beneath it, behind it or beside it on a separate site. The street and the square  the collective domain  are viewed in a much more positive light than the style of architecture. In Poundbury, better known as the Prince Charles village, the architects fought the fire department in favour of the construction of dead-end streets and against roundabouts and through roads. Also included are alleyways, small shortcuts for pedestrians and cyclists only. You wont find them in contemporary residential districts. This book would have been stronger if Ibelings and Van Rossem had sided more explicitly with traditionalism and, from there, counterattacked the numerous accusations made against it. After all, another lesson we learn from history is: attack is the best form of defence.